Nestled in one of Calicut’s favourite residential regions, Kaithapoyil, Landmark Village promises to provide residents with a serene and tranquil sanctuary away from the hustle and bustle of the city. Set on 20 acres of lush greenery, Landmark Village offers apartments, sky villas and duplexes that elegantly blend smart designs, brilliant architecture and chic décor. Though these premium sky villas and apartments are snuggly cocooned amidst scenic mountains and valleys, the fact that it is located close to Markaz Knowledge city makes it an ideal choice for those seeking the vibrancy of integrated township in the form of elite educational institutions, medical establishments and recreational facilities. Life is about moments, so enjoy these fortunes, at awesome best here. Inspired by the principle of 70:30 open space style, Landmark Builders Calicut; the expert builder, designed Landmark village to elevate the concept of Green living. With 70% of the spaces dedicated to recreational and outdoor activities, you get to enjoy the peaceful ambience and enchanting experiences of breathtaking views of the surrounding landscapes. As Jane Austen says, there is nothing like staying at home for real comfort! Landmark Village offers you opulent and ultra-spacious apartments, duplexes and sky villas for your comfort. These spaces are ideal for home and office purposes and can help in balancing home and work-life balance. Each of these units is meticulously planned and designed to meet the contemporary needs of modern lifestyle while blending nature with its core architecture. With the most exquisite fixtures and fittings, the interiors give an air of grandeur which gets enhanced further by natural light and ventilation. Landmark village have raised the concept of luxury flats in Calicut by offering optimum privacy, security and comfort to its residents. The apartment complexes are surrounded by compound walls and security personnel 24 × 7 to ensure the safety of each and every person residing in the gated community. With these surveillance measures, you can be at ease and make your life hassle-free. With Wayanad hills as a neighbour, Landmark Village is a place where you can revel in breath-taking views of the lush green mountains all day long. Every unit of Landmark Village is tailored in such a way that you get to enjoy a free flow of fresh, natural air and light from the windows and balconies. Take a stroll through the grassy slants, and you can loosen up from all the tensions and hustles of modern life. Or you can enjoy a break by taking a hike across the hill stations of Calicut which is rich in bio-diversity while having numerous mountain caves and tree houses. Landmark Village located at Kaithapoyil is just 40 kilometres away from Calicut. As it is close to the Calicut – Wayanad National Highway 212, Landmark village is easily accessible by road, rail and air. 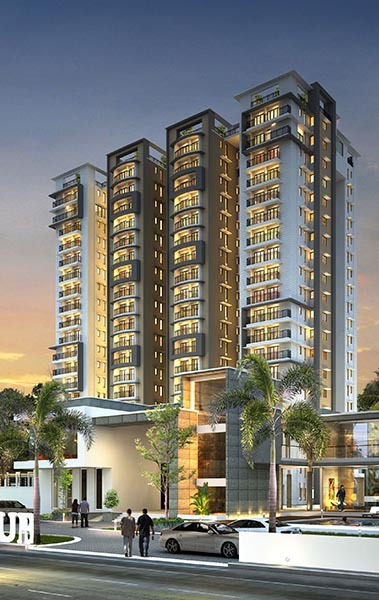 On top, it gives the residents easy access to all the necessary necessities and urban comforts of the city.